However I thought that it might be easier and more accessible (for you and your peers) to keep the analysis in a visual form too. 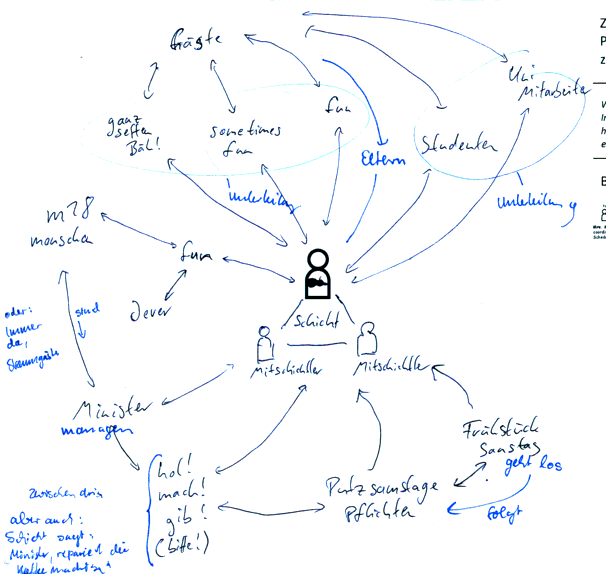 The process is a bit like creating personas: You gather your data, analyze it and create a prototypical representation. 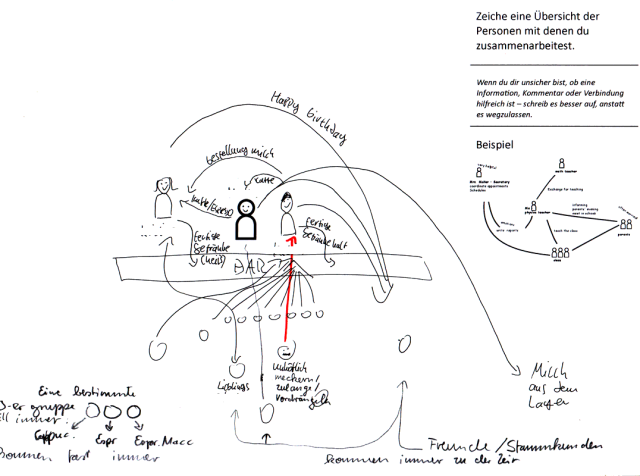 The starting point is still having the visual descriptions you created with your participants. The first step is to compare the diagrams and make annotations. For this you can copy the diagrams and write on the copies. If you like to keep it digital, you can use any application which can add text over images. Look for similar or interrelated information, mark these and write down your thoughts. If you asked questions and made additional notes, use these too to supplement the information in the diagrams. Create a visual summary of the data using informations which are consistent or similar across your participants’ diagrams and/or your other notes. 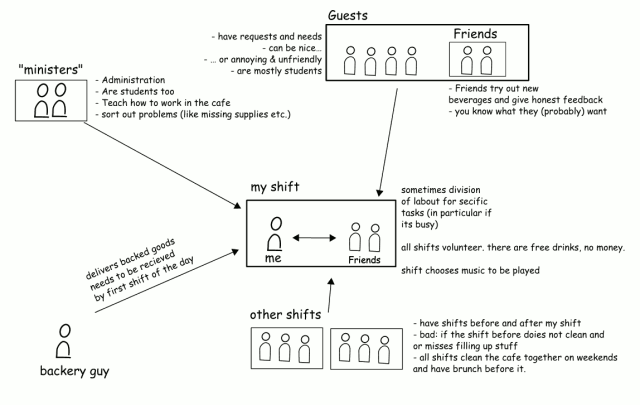 The diagram is based on things that were at least in two of the participant’s diagrams. 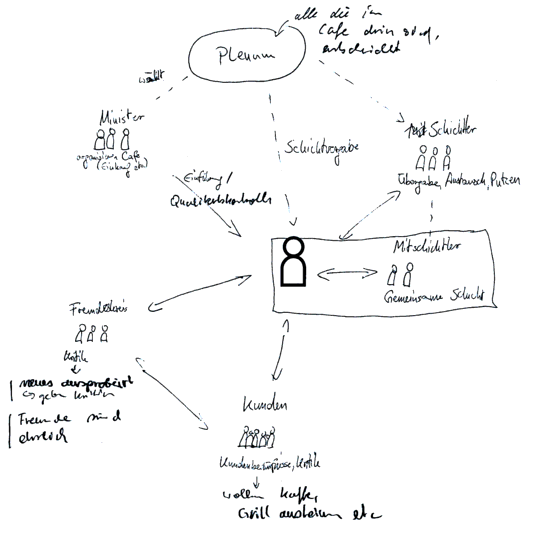 Nevertheless, don’t hesitate to use information which is not on the diagrams: Conversations or other diagrams (e.g. workflows) can be used as well to make this overview. 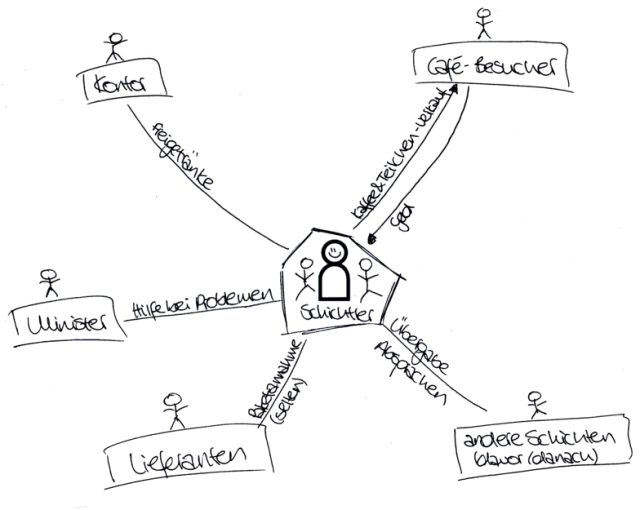 There is not one "ideal" representation for a visual summary of your participant’s diagram s and mappings. It should be data based but this does not mean that two people will create exactly the same visual summary out of the same data. Time wise it was clear that the shift changes where friction points. They happen at the begin and the end of the shift. It was as well clear, that most participants were happy when customers came. 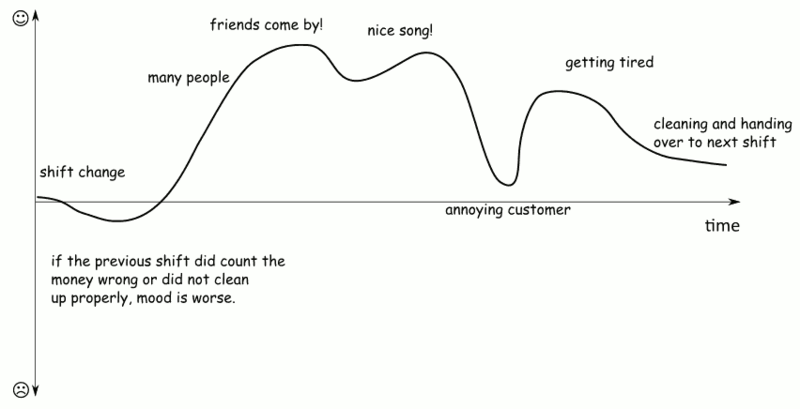 However, the point in time when friends come by, when a nice song is played or when an annoying customer comes is not set – it can happen at any time. So I included them at some plausible point – though it could happen at another time too. I suppose this is recognizable in the time-diagram above that some things are fixed, and some others may just happen. But using the above diagram someone could indeed suppose that the nice song is always played in the middle of the shift. Just like personas, the visual summaries need to be interpreted with common sense. They are are a plausible example of how an experience may be. Enjoy the method – if you have any examples or want the share experiences, write a comment below!